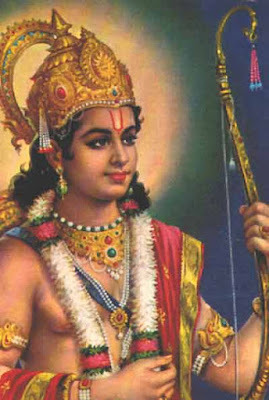 Ramnavami, or Rama Navami, is the birthday of Lord Ram and is celebrated by Hindus around the world on the ninth day of the Shukla Paksha (waxing phase of moon) in Chaitra month (March – April). The way how Ramanavami is observed is different for different Hindu communities but fasting remains an essential part of the puja procedure. Here is a brief idea on how to observe Ramnavami. On the Ram Navami day, after thoroughly cleaning the house, idol or picture of Lord Ram is installed in the puja room. Some people also keep portraits of Mata Sita, Lakshman and Hanuman along with Lord Rama. Bananas, Tulsi leaves and usual puja flowers are placed near the deities. The important puja is performed at noon as it is believed that Lord Ram was born at noon. An Arati is offered at noon and devotional bhajans are sung. Tika is applied and water is sprinkled on the people present. The devotional songs sung include any one Ram Bhajan or Vishnu Sahasranama. Ramayana, especially the chapter Sudarkand, is recited on the day. There are also people who fast the entire day. Some communities also opt for nirjal fast - fasting without water. In South India, Ramnavami is people do elaborate puja and traditional fan (Visari) is distributed along with the ‘Prasadam.’ Food and drinks that cool the body are prepared on the day and is consumed after the fast.